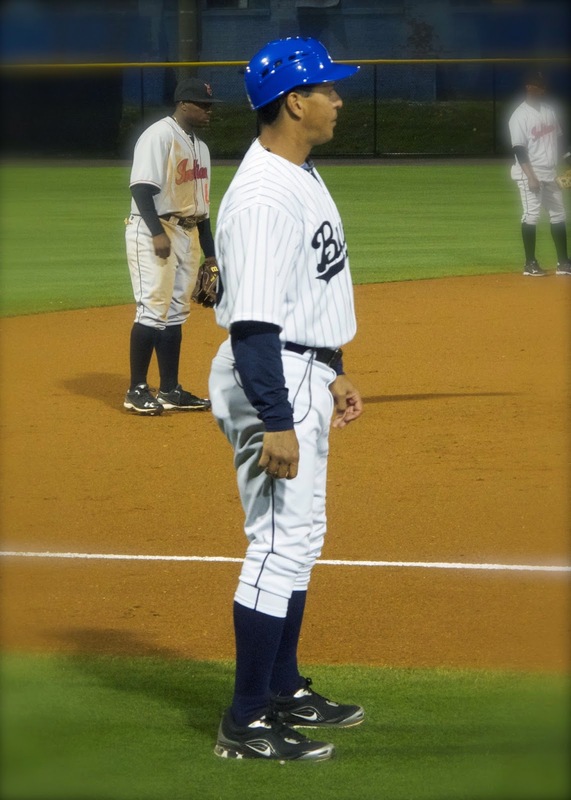 When I started this blog back in 2009 Charlie Montoyo was the manager of the Durham Bulls. Just about every home game inning I have ever seen began with him running down the third base line to take his position in the coach’s box. The photo above was taken on May 9, 2011, at one of the two “Back to the DAP” games played in the old Durham Athletic Park. Now he will be starting his dash down to third base in a Tampa Bay Rays uniform at Tropicana Field in St Petersburg, Florida and, unless we’re watching on TV, we aren’t likely to see him make that run again. I’ll miss him. I’m not alone. I commend to you the several posts which show you a bit of his character and accomplishments. The first is the announcement by the Bulls; the second is a collection of very thoughtful pieces from those who interacted with Charlie on a regular basis, folks like Neil Solondz, Patrick Kinas, Mike Birling, Scott Strickland, Scott Carter, and Colin Sanders. A great read. And lastly, Steve Wiseman over at the Herald-Sun got some nice quotes from Charlie about his promotion. And it’s not just Charlie that I’m going to miss. I remember getting an interesting comment to a blog entry a couple of years ago from someone claiming to be Charlie’s wife. Turns out the commenter was Charlie’s wife, Samantha. From time to time she has added her two cents to our postings and we’ve had a couple of fun exchanges over on twitter in recent years. I’ll miss them both. But here’s the important point I want to make: From a fan’s perspective, from someone who can only evaluate him from what I’ve seen on the field, Mr. Montoyo is one terrific leader and manager of ballplayers. I have to say that I was expecting and hoping for his promotion to the Rays, even though it might mean a bit more uncertainty than we Bulls fans are used to at the beginning of the season. Good luck and, most of all, have fun in your new job. Thank you for all the great years you gave Bulls fans.